Sorry I'm posting so late today, I've been so busy! I felt like doing some nail art so I've got a really pretty Easter manicure to show you that I did earlier. I've seen so many Easter egg manicures online recently and it inspired me to try and recreate them! I actually did this last night but it got messed up and dented overnight while I was sleeping so I had to redo it! Left hand: Essie Absolutely Shore, MUA Shade 9 blue, Essie Navigate Her, 17 Supreme Shine Simply Pink, NYC Colors Lexington Yellow. Right hand: Rimmel Lycra Pro Aqua Cool, Essie Tour de Finance, Oh My GOSH Baby Blue, Rimmel Lycra Pro Peppermint, BeautyUK Smokey Lilac. I painted each nail with my chosen colour (ten in total) and then took a ziploc bag and dropped one drop of the first nail polish onto it. Because I don't have a dotting tool I used the end of a biro pen to pick up a bit of polish and dot it onto all of the nails that didn't have that colour painted on them. I repeated this for every colour until I had done all ten, then added a layer of Seche Vite and this is what I ended up with, hope you like it! The picture of my left hand was taken in the shade and my right hand in more direct sunlight. The sunlight picture was the only one that showed a difference between the baby blue and peppermint polishes on my middle and ring finger! Hope you like my nail art! Enjoy the rest of your bank holiday weekend! I really need to get a dotting tool! 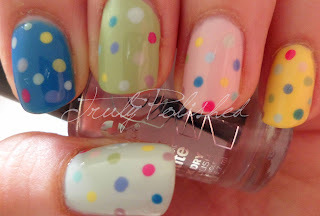 I love polka dots but I've never got around to getting one before this mani! Awww thanks! I'm just about to take it off and I'm a bit gutted, but I have too many new pretties to put on! Glad you like it! 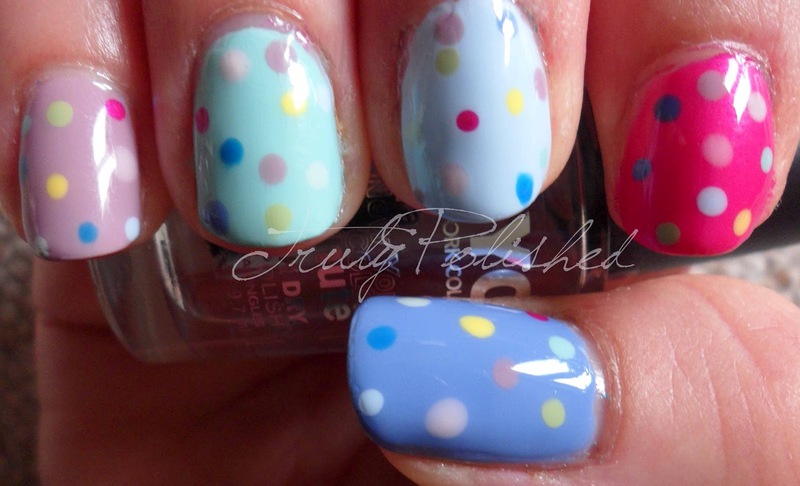 This is a really easy nail art manicure if you're just starting out! Thanks, I was so happy with how this turned out!